Our plan for the big trip in 2010 was Iceland in June, but the volcanic eruption blew that away. 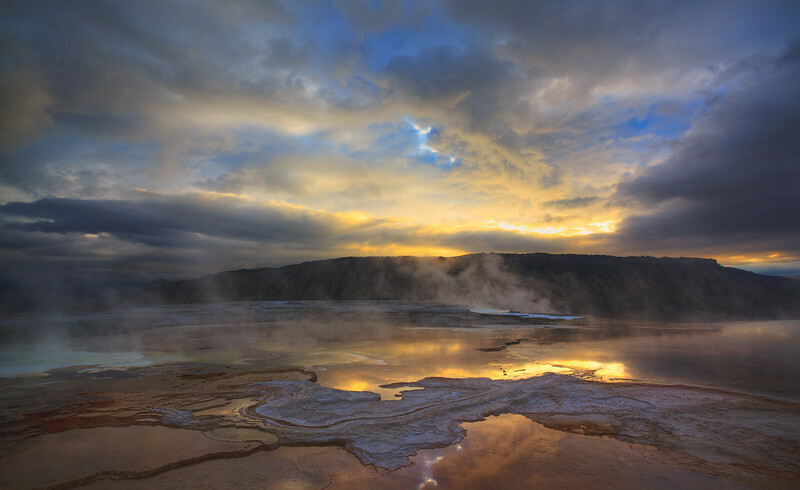 We changed course to Yellowstone, which has more geysers than Iceland and is also itself an active volcano. But hotels inside the Yellowstone were fully booked the entire Summer, and so we decided to go in early October. In many ways, fall is a better time to photographers, at least in being not crowded at all. We were so fortunate that we saw grizzle bears at close range 3 times! We also followed the wolf paparazzi, whom pointed us to the wolves. Although they were only visible through a powerful binocular, it still generated a lot of excitement. Needless to say, we saw most of the geysers as well, including climbing uphill to get a full view of the Grand Prismatic. Mammoth Hot Springs though were a bit of a disappointment as most were pretty dried already, although the colorful sunset and sunrise did decorate them a bit. In short, it was a wonderful and satisfying trip. We started off visiting Grand Teton before entering Yellowstone. We also added Vermont as our last leg before leaving the US by JFK. The photos here are the Yellowstone ones only.